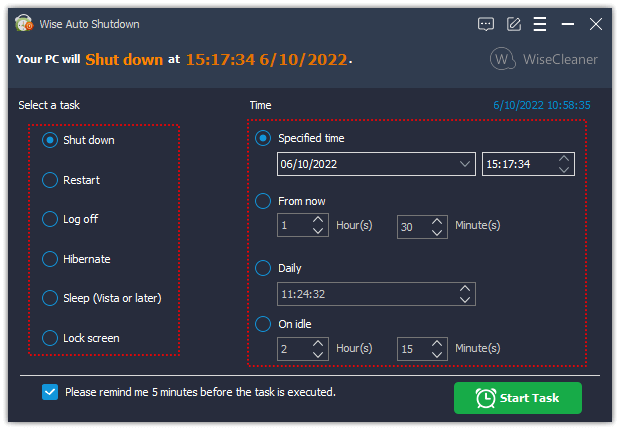 Wise Auto Shutdown is a free and professional utility to shut down your PC automatically. With its help, you can easily schedule your computer to shut down, log off, restart, sleep, and close power at any time you want. Moreover, Wise Auto Shutdown will remind you of your choice five minutes before it carries out the automatic task. Step 1: After launching Wise Auto Shutdown, you will find the task and time are listed in two parts. Step 2: Please select a task type you want to take and set a schedule. Step 3: After the setting is finished, please click “Start Task”. Notes: The reminder of your task will pop up according to the time you set. What are the difference between Shutdown and Power Off? What are the difference between Sleep and Hibernate?